Teela Reid joined NSW Legal Aid, her first job as a solicitor, in March. Previously, she was tipstaff to Justice Lucy McCallum of the Supreme Court of NSW. Before that she was a high school sports teacher. 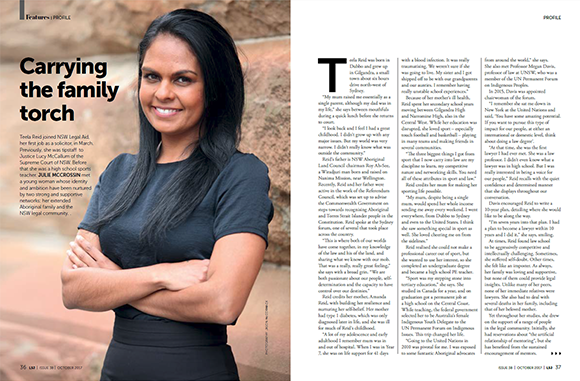 Julie met a young woman whose identity and ambition have been nurtured by two strong and supportive networks: her extended Aboriginal family and the NSW legal community. Published in the October issue of the Law Society of NSW Journal. The Internet of Things – the Next Industrial Revolution?